For the pastry, place the flour, sugar and lemon zest into a bowl and rub in the butter until the combination resembles breadcrumbs. Add the crushed egg and stir with a round-bladed knife till the mixture varieties a dough. Pierce the top of the dough in several locations to allow steam to escape while baking. For a fairly glazed high crust, brush this—and another double crust pie—with milk or cream and sprinkle with sugar before baking. I made this for the first time for a cocktail party I had last week – principally as a result of I wanted to see what all of the fuss was about. 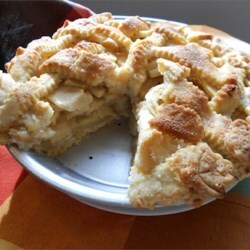 Place the apple filling into the pie dish, ensuring that it rises above the sting. Sprinkle the pie with sugar and bake in the centre of the oven for 45-55 minutes or golden-brown throughout and the apples are tender.